Belgium is, among other things, known for its comics, and I suppose you can’t find anyone who doesn’t know ‘Suske en Wiske’, we all grew up with them. One of the most important characters in the stories is Lambik, and here they gave him his own bar! He is a slightly arrogant and silly character, but his heart is definitely in the right place. 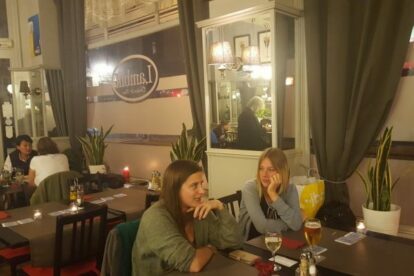 If you like eating in a very typical brasserie, please go to café Lambik with its cosy atmosphere, charming waitresses and quality food! It used to be a very ‘brown’ place – we say that about an old cosy bar with lots of dark wood – but some modifications were made in 2016 and now it’s still homely and inviting, only with a modern touch. The owner loves to please his customers and stops at every table to check if everything is okay. No nonsense and not expensive at all. Trust me, eating here will make you happy! Don’t forget to make a reservation if you want to eat here during the weekend, it’s a big place, but it is popular as well!